Metal dichalcogenides are excellent solid lubricants due to their graphitic structure and weak inter-layer bonding, which combine to facilitate shear. One of the typical metal dichalcogenides is tungsten disulfide (WS2), which can be either dispersed into liquid lubricants, like graphite, to reduce the friction and wear between moving surfaces; or used as a solid lubricant by itself. WS2 is an intrinsic solid lubricant and it functions effectively as a lubricant in air and inert gases as well as in high vacuum over a large temperature range. In the solid, the molecular units line up to form a hexagonal crystal structure in which the adjacent molecules along  direction interact through weak van der Waals forces. The unit cell includes two adjacent layers and thus has hexagonal symmetry with a 2H arrangement. 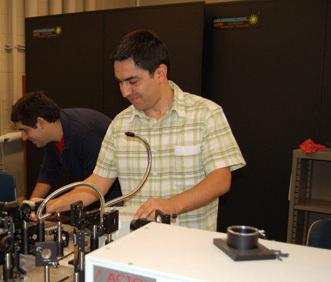 As part of the Ph.D. thesis project of Emre Selvi, a CDAC group from Texas Tech including Yanzhang Ma, Resul Aksoy, Atila Ertas, and Allen White carried out high pressure synchrotron x-ray diffraction experiments to investigate the properties of WS2 to 26 GPa at room temperature. By fitting the P-V data to its equation of state parameters, the bulk modulus was determined. The c-axis of the hexagonal structure is found to be much more compressible than the a-axis [Selvi, et al., J. Phys. Chem. Solids, 67, 2183-2186 (2006)]. 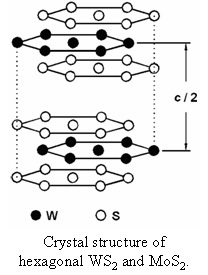 Another disulfide, MoS2, has a crystal structure and applications similar to those of WS2. 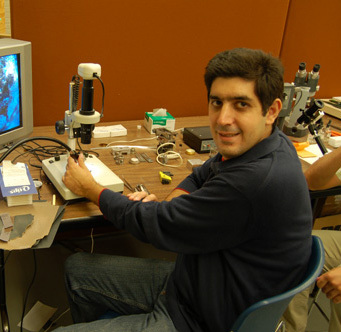 As part of his Ph.D. thesis project at Texas Tech, Resul Aksoy and his advisor and coauthors, Ma, Selvi, Ming C. Chyu, Ertas, and White investigated the high-pressure behavior of MoS2, by synchrotron x-ray diffraction, to nearly 40 GPa at room temperature. The ratio of the compressibilities of the c-axis to the a-axis is approximately 3 at lower pressures (below 10 GPa). The ratio gradually decreases with increasing pressure with an apparent, phase transformation at high pressure and low temperature [Aksoy, et al., J. Phys. Chem. Solids, 67, 1914-1917 (2006)].